The family formed a mob after the TV host and his crew gate-crashed the wedding last December. 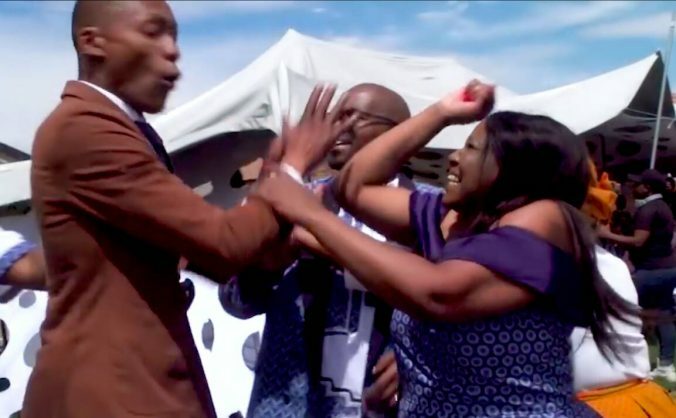 Ever since social media users first heard the news that the presenter, producers, and camera crew of Moja Love reality show No Excuse Pay Papgeld were assaulted by aunties and relatives of a groom they confronted at his wedding for allegedly failing to pay papgeld, they have been waiting in anticipation for the dramatic episode to air. They will finally get their chance to see the confrontation when the second season of what can arguably be called “South African TV’s most dramatic reality show” airs. Sunday World reports that presenter Moss Makwati and his crew surprised the groom and his wedding guests on a Saturday in mid-December and a scuffle ensued when the family didn’t take too kindly to Makwati’s presence. He and his crew are said to have sustained injuries from being pelted with stones and other objects by a mob consisting of the groom, his bride, his aunties, and a group of grannies. According to the show’s producer, Noxolo Mthethwa, the chaos was followed by a car chase instigated by the family. “Makwati was assaulted by the groom and his bride after he approached the groom in front of all people. The man was not happy about the questions asked. They even confiscated one camera which fell when the crew ran,” Mthethwa told the publication. She went on to explain that the crew gate-crashed the wedding as a last resort after failing to reach him on multiple occasions. This was done in an attempt to get to him to answer for defaulting on court-ordered child maintenance for his three children from a previous relationship with an American citizen to the value of R25,000 per month. Watch the scuffle unfold in a trailer for the upcoming season. #Papgeld is going bolder. Catch Season 2 this Febuary on channel 157 Moja Love TV as we continue to fight for the rights of children. The show airs on Moja Love DStv channel 157 every Saturday at 6:30pm and repeats on Sunday at 8pm.